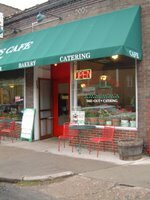 The Twin Cities Breakfast Club Blog: Hippie food for breakfast? Until we have new restaurants to review there are always the "old standards" that need to be discussed. 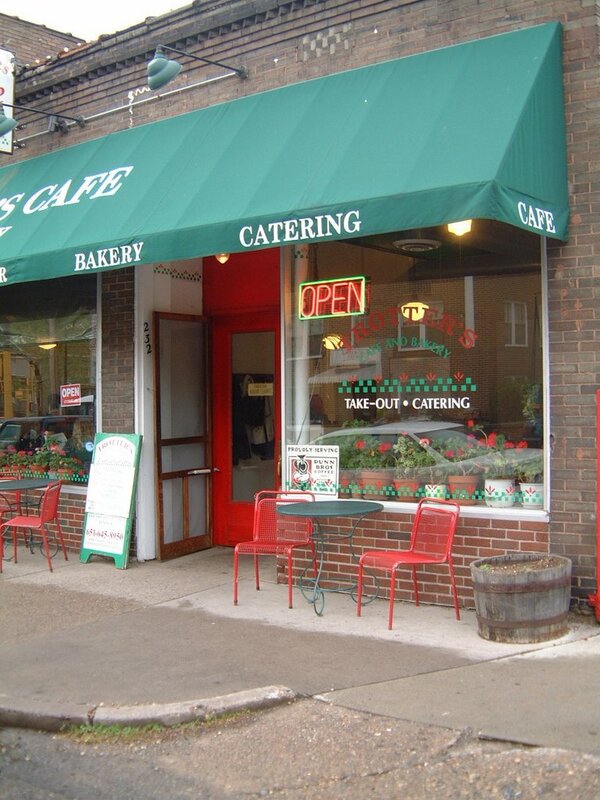 The next "old standard" on my list is Trotter's Cafe and Bakery in St. Paul. Rachael discovered Trotter's when she lived in St. Paul. When Rachael was first brought into the Breakfast Club fold, Trotter's was her first suggestion to the group. After watching Breakfast Club tear apart restaurant after restaurant, she was extremely frightened that Trotter's would meet the same fate. Not only did Trotter's survive the initial visit, it made it into the pantheon of old standards. Trotter's is a "granola-y" old hippie hangout. They serve local organic eggs and meat and bake their own bread onsite. Don't even bother asking for white toast with your meal. They will politely nod their heads and then serve you wheat toast. They serve all the breakfast standards, but in smaller quantities and made with about 1/10th the grease as most places. It's perfect if you would like to have two egg, bacon, potatoes, and toast, but don't want to physically feel your arteries closing as you eat your breakfast. Below are some of the menu highlights (and lowlights). Trotter's Three-The standard two eggs, bacon or sausage, potatoes and toast. The potatoes are not the best. Breakfast club is partial to hash browns and these are fried potatoes. Because they use much less grease, they are unable to crisp the potatoes to a sufficient degree. They make up for it though, by adding a nice spice to them. The bacon is spiced with apple and cinnamon, which has polarized the group. Luckily those that don't like the apple cinnamon spice can get the sausage, which is very good, even if it is in link form. Tortilla Lucia-This is Trotter's version of Huevos. Sarah gets it almost every time we go, and gives it high marks all around. Potato Mountain-This is a great dish if you are marathon training and are carbo loading in preparation for a long run or eating to recover from one. It consists of a giant pile of potatoes, fried up with green peppers, onions, tomatoes, and cheese, then topped with eggs cooked the way you want. If you are like me and like to have egg yolks co-mingle with ketchup and the potatoes, do not order the eggs over easy, as they will come over hard and you will get no yolk and be sad. If you want yolk, order your eggs sunny side up. Today's Scramble-This is a combination of eggs, two or three vegetables, and some type of cheese scrambled together. Rachael is enticed by this every time we go and sometimes she succumbs. She usually is happy with it, but wishes it came with meat. Pancakes-Restaurant pancakes are hard. Pancakes are especially hard if you are an earthy, granola type restaurant. Trotter's doesn't make light and airy pancakes that serve as perfect vectors for butter and syrup. They make dense and hearty pancakes and add things like corn meal, oatmeal, bark, twigs, and other such things. If you get it, only order one, I have never seen anyone eat an entire double stack of pancakes. Even the people that eat one pancake (it takes up the entire plate) refuse to even look at food for the next eight hours. Other important notes. Trotter's is semi-self serve. When you enter, you go to the counter and order your food. They give you a sign and you find a table for yourself. They bring the food out to you when it is ready. Everything else is up to you. You have to get your own silverware, napkins, ketchup, water, and coffee refills. When you are finished, you have to bus your own table. This is the reason Alex does not like Trotter's. Alex likes to be served 100% when she eats breakfast on the weekend. I actually really enjoy this feature, because it allows me to drink about 35 cups of coffee and completely abuse the half and half and sugar dispensers. I like not being beholden to the waitress for my next cup of joe and am somewhat embarrassed about having to request more half and half. Amadeus - You have forgotten (a couple of) imporant points about Trotter's. 1) THE GRANOLA: OMG. Breakfast Club includes several devotees who worship at the alter of Trotters house-made granola. It is hands down the best in the city. The best. This granola contains the perfect blend of nutty, crunchy, whole-grainy and sweet (available with or without raisins - T.B.C prefers the variety with out raisins). It is available as a breakfast or, as some of us prefer, in a 1-lb bag. We love it so much that sometimes we buy a bag to nibble while we wait for our food. Certain members of Breakfast Club have been known to travel to St. Paul solely to buy the granola. 2) Trotter's other food. I've mainly had soups and sandwiches. The sandwiches are fabulous. (particularly the pastrami) Soup is either great or ok. In any case, even though we appreciate that Trotters is looking out for our health, usually you will probably want to add quite a bit of salt to your order of soup. 3) Baked Goods. Cookies, and lemon bars get an A+ from me. Um. Yes. The bark and twigs. The lack of grease. The having to serve yourself and do your own clean-up. I do believe you have captured the essence of Trotters. Why go out to eat if you are just going to have granola, anyway? I have granola in my own cupboard, and I occassionally even have milk fresh enough to pour on top of it. And I have to bus my own table at home, too. I know the analogies section of the SAT is dead, but here's one for you: Trotters is to going out to eat as going to work is to being on vacation. In fact, the only reason to go is to socialize with the other club members (and to gripe to them about the counter service), which is of course worth it in its own right. We went to Trotter's for the first time last weekend. I had the granola and it was all right. Rachael is going to kick me in the shins for saying this, but I like the Birchwood's granola/fruit/yogurt thing much better. It has almonds and isn't so sharp. But it was pretty good, and I'll probably go back to try some of their other breakfast options some day. But I have to say I don't really like the self-serve format for breakfast either. Actually, busing dishes is fine. Ordering at the counter is fine. Getting your own silverware and napkins, fine. But the cream and sugar? And JAM? At the COUNTER? I just don't feel comfortable getting up from the table every time I need a little more jam. Or sugar. It interrupts the flow. Can't they get some of those little jam packets and sugar dispensers for the tables?